A solar generator can be invaluable in times of a power outage or while traveling in your car, providing needed power to run small appliances, inflate your tires or to jump start your car. 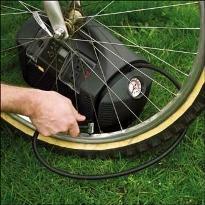 A portable solar generator will give you the security to know that if you or a loved one has a flat tire it can be inflated just long enough to get to a service station or safe location to either change the tire or wait for help. 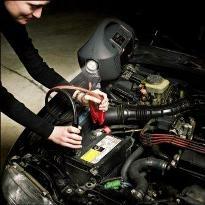 Likewise, it can provide a jump start for your car if your battery suddenly dies. Also, in the event of a power outage you can use it to power a light, a radio or other small appliances. 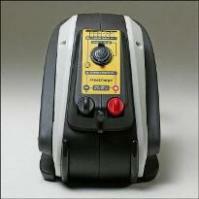 As you can see there are a multitude of uses and reasons to have a solar generator in your home. Take a look at the solar generators below to see which makes the most sense for you and your family. This compact portable solar generator can be a real lifesaver for you and your family at home or on the road. During a power outage you can power a lamp or other small appliances. There are two 120 volt outlets so you can run 2 devices at once. If you are on the road and and have a flat tire or need to jump start your car, you can use the built in flashlight and the 12 V jumper cables to start your car or use the built in air compressor to pump your tire back up until you can get to a safe place to get the tire changed or repaired. If you want to use this as a solar generator and charge this Powerpack with Free solar power, then see our recommendations below for several solar panels that will work with this unit. Also included are AC and 12 Volt charging adapters so you can also charge it from the wall outlet or your car or trucks cigarette lighter. You can also connect this Powerpack with the Freeplay FreeCharge Weza Portable Energy Source with the cigarette lighter adapter and double your power. Click Here To See The Solar Chargers Listed Above. This Portable energy unit is truly unique and has many uses. 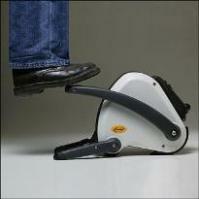 It provides 12 volt power that is generated by stepping down on a foot pedal and the internal generator spins generating up to a 40 watt rate of power. With just a little effort you can have a fully charged unit to jump start your car or power small appliances in the event of a power outage. Of course there is an AC adapter included so you can keep this unit fully charged from the wall socket, so it will be ready to go when you need it. Use this unit with the Xantrex XPower Powerpack 400 Plus and it can provide even more safety and security for you and your family by providing power to run lights, small power tools, a computer or watch a small to mid sized TV. 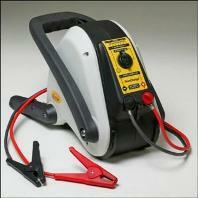 If your ever caught without power this Freeplay Free Charge Portable Energy Source can be a true lifesaver. 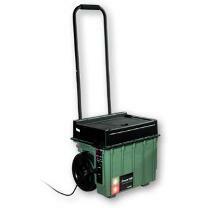 This unit has positive and negative posts, heavy duty 66” jumper cables and a cigarette lighter output. There is also an LED indicator to show the level of charging while you are pedaling, and with the touch of a button you can see the battery charge level. Dimensions: 8.5”W x 17.25”D x 11.1” H.
Note: This item is shipped from Florida so it may arrive a little sooner or later than other products purchased on the same order. Ground Shipping Only. Sorry no PO Box Delivery. At any time your power can be knocked out, whether it’s from a thunder storm, ice storm, hurricane or earthquake. 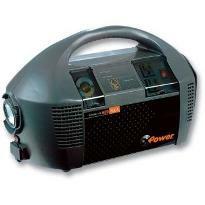 If you are without power, are you prepared with an alternative power source for your family? With the Xantrex XPower Powerpack 1500 you can power your computer, a small refrigerator, operate small power tools, or a small to mid sized TV. On a full charge you can run your desktop computer for around 5 hours, If you have ever had to go with out power for several hours or several days you know what a convenience it is to have these power for the essentials in life and to stay in touch. This Powerpack has 2 AC outlets so you can power 2 devices at the same time. Having the same power as the larges back up UPS (uninterruptible power supply) for computers, this unit is much more flexible in that it is portable and able to be wheeled to whatever location you need it. The portable cart can be removed and stored if you want to leave the unit in one place for a period of time. This unit is recharged by plugging it into a regular wall outlet or by plugging it into your car or truck’s cigarette lighter with the DC charging cord that is included. Because of this Powerpack’s smart charger, it will never overcharge so you can leave it plugged in forever and the power cells will never be damaged. Note: The Xantrex XPower Powerpack 1500 is drop-shipped UPS Ground from the manufacturer in Pennsylvania, so it may arrive a little sooner or later than other products purchased on the same order. Sorry, no international shipments. Return from solar generator to residential solar power. Return from generator to solar energy scene home.